It is a well-known and researched fact that we should eat a balanced meal WITHIN an hour after waking. Many people don’t manage this due to severe time constraints, and the pressures of getting to work or school on time. Often long distances have to be travelled (in heavy traffic) – and so one arrives at our destination hypoglycaemic (low blood sugar level). Starting the day with a low blood sugar level is not good for general health, puts you in a compromised position for daily performance: preventing optimal concentration and productivity – and leading to chronic fatigue later in the day. Using the Supa Shake you get a fully balanced, fibre-rich, energy-sustaining meal replacement drink, before leaving home or even in your shaker en route to work or school. This will ensure an optimal start to your busy day – with benefits to BOTH HEALTH AND PRODUCTIVITY! With Supa Shake, you have a meal on the go. The Supa Shake is available for purchase online. Buy one box for personal use or save and buy a carton of 6 boxes or more. Medical practititioners get a further 33.3% off the already discounted bulk price. The Supa Shake is Low Gi, enriched with vitamins and minerals which includes good sources of Vitamin C, B Complex, Zinc and Selenium. Selenium is an anti-oxidant that fights cancer, heart disease and other chronic diseases. What’s more the Supa Shake is a great source of protein (Soya) and fibre. 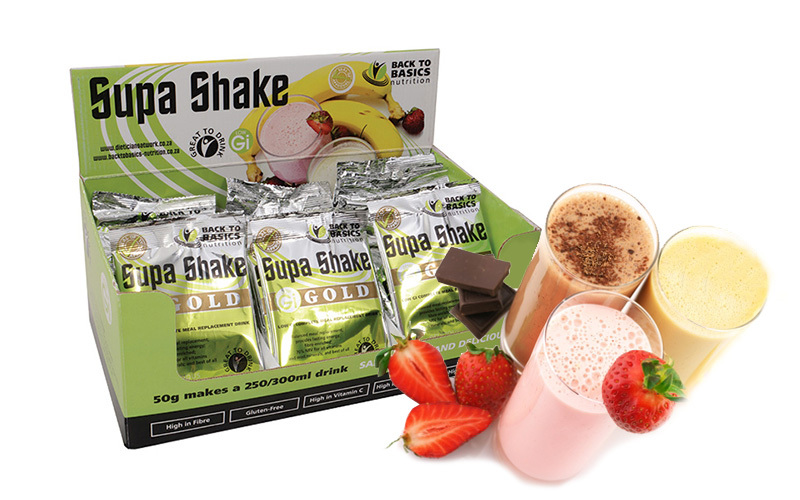 The Supa Shake comes in a small foil packet which is a Single-serve sachets of 50g powder. Dissolve the content in 250ml or 400ml water depending on your taste preference. It’s easy and delicious to make yourself a nutritious and delicious meal on the go anywhere….anytime. All this and it’s suitable for Lactose and Gluten intolerant people too! A great dietary supplement where there is loss of appetite due to illness / medical treatment but a need for proper nutrition. Supa Shake contains CHOLESTEROL-LOWERING ingredients: SOYA, FIBRE and a low GI carbohydrate source (insulin); and is also rich in antioxidant vitamins which are scientifically proven to significantly reduce heart disease risk). In addition, although the Shake does contain fat, when consumed as part of a balanced diet, does not exceed >10% of total energy. Post-operatively: Due to the added vitamins and minerals, and the good quality of the protein and carbohydrate – this meal replacement and / or supplement will enhance tissue repair and growth and thus speed up the recovery process. Post- cancer treatment where appetites are decreased yet nutrition needs are high. Fussy eaters or those with Food allergies are difficult to give a quick nutritious and delicous meal to. For the sports field, before a run in the morning or just a mid day snack. Both our products are Gluten and dairy free. Mixing the Supa Shake with water instead of milk is still delicious and creamy. You can also substitute your own milk if you prefer – Almond, rice, lactose free milk – will all mix easily with the Supa Shake powder. We sell to the public and to medical professionals for resale. We know you want to take a look at the back of the pack to get the nutritional breakdown. The Supashake can be used as a base for a range of delicious smoothie recipes. We have put a few of our favourite mixes together for you to try.